Landscaping around our homes can play a vital part in preventing communities from flooding and the problem and what we can do about it will be highlighted at this year’s RHS Flower Show Tatton Park (19th to 23rd July). Visitors will be able to see a special show garden sponsored by United Utilities aimed at raising awareness of the problems that urban development can cause for public draining systems. 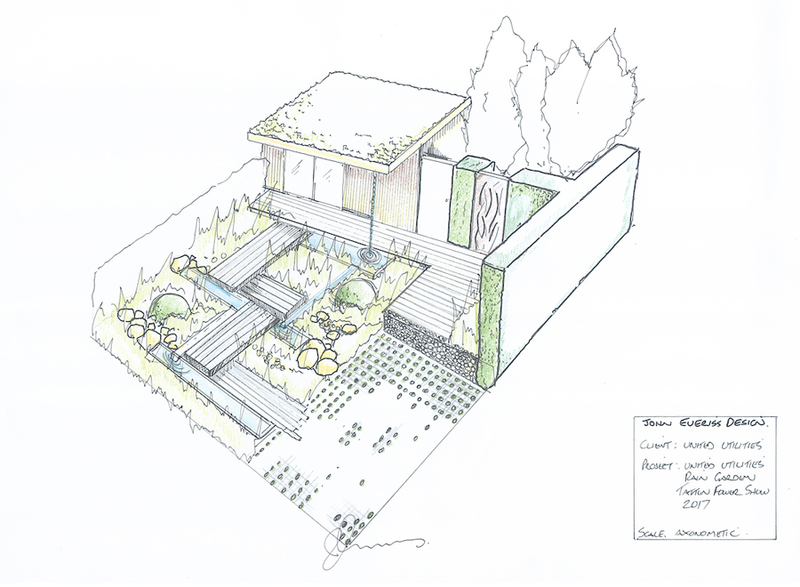 The ‘Slow the Flow‘ garden, by award-winning designer John Everiss, will demonstrate ideas for gardeners to manage rainwater and reduce their own impact on our drains and sewers. In numerous reports, the Royal Horticultural Society (RHS), has pointed out the growing problem of urban development and the number of front gardens completely paved over. In the North-West, United Utilities point out that this number has increased by 4% in 2005 to 21% in 2015. The loss of so much permeable ground is steadily increasing the risk of more flooding in our towns and cities. With back gardens also increasingly being built over with new extensions and conservatories, there is a greater need than ever for homeowners to make small changes in how they use their green space. Jo Harrison, Asset Management Director at United Utilities, points out that anyone who has ever been through the trauma of sewage flooding into their home knows just how awful and devastating this issue is: “We only have to walk around our towns and cities to witness the rapid urban development, and we all need to think creatively about how we can use our green space”, explained Jo. Gardener designer John Everiss (pictured left) explains that there are lots of ways to create a new parking space, patio or extension and still have an exciting and beautiful green space with low impact on drainage: “I’ve used a number of different techniques in the ‘Slow The Flow’ garden to help people see the possibilities,” he says. “There are subterranean water storage channels, gabion walls using beautiful stone, permeable paving and a living green roof, to name a few ideas. People will see that the overall effect can be very stylish and modern. Our world is changing, we are seeing more extremes of weather with dry periods and torrential rain. Why fight against that when you can design your outdoor space to make the most of these variable conditions? Your plants and wildlife will thank you for it, as well as your neighbours downstream,” he added. Visitors to the Show will have the opportunity to discuss the garden with representatives from United Utilities. United Utilities is the UK’s largest listed water company and manages the regulated water and waste network in North West England including Cumbria, Cheshire, Gtr Manchester, Lancashire and Merseyside. John Everiss has been a professional garden designer and landscaper for over 25 years and is based in Chorley. 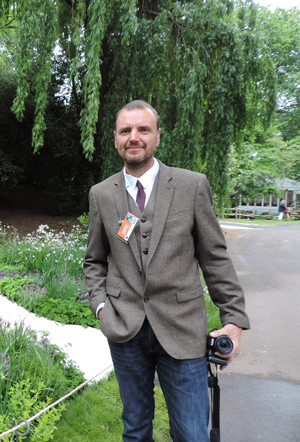 John is an RHS Gold Medal winning designer, achieving gold at both Tatton Park and Chelsea Flower Shows. The ‘Slow the Flow‘ garden has an important message for all gardeners and householders with plenty of useful ideas for slowing the impact on drainage.